Chiswick - Gold, Silver and Bronze Leaf Medals! We have been greeted by deep green grass and golden Autumn leaves covered in dew drops this week, a gorgeous sight and one which fascinates the children, who are coming to terms with the difference between rain, dew, frost and snow. The grounds of Kew gardens became an Olympic racetrack as the children tested their speed in a series of races. Gold, silver and bronze leaf medals were awarded to the winners whilst bystanders became commentators and discussed the races as they happened. The children have been doing their bit and helping the Kew Gardens grounds people by sweeping up the leaves from the forest floor into big piles, as we have seen some of the gardeners do recently. The children were curious as to what happens to the leaves and where they are taken, which led to a discussion about composting. 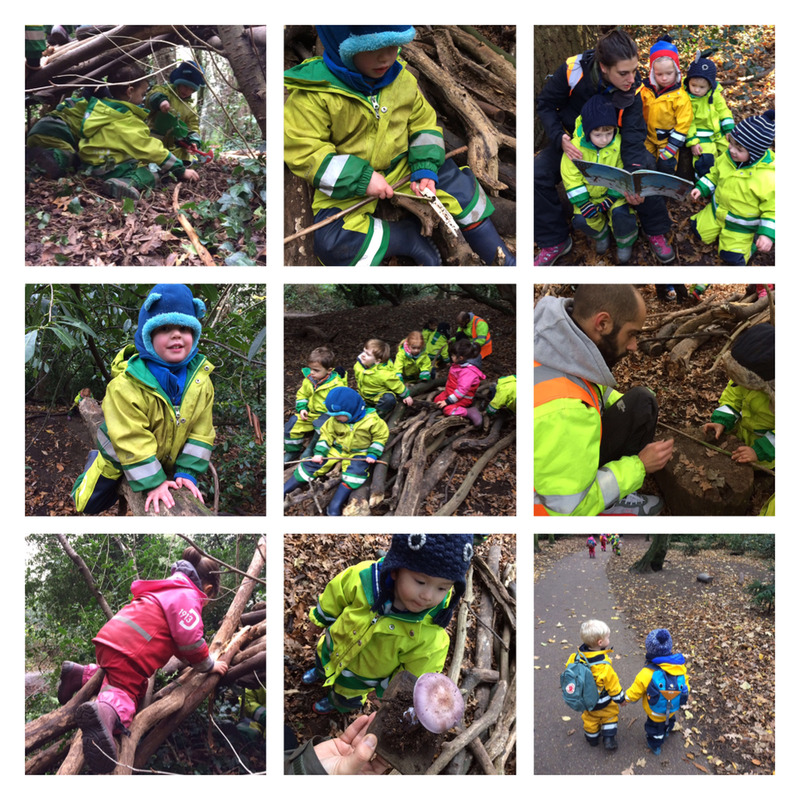 Karina and the children took a wild and bumpy speedboat ride through the Chiswick forest this week, proving once again that a circle of logs really can be anything you could imagine. The children took turns steering the boat, narrating when the big bumpy waves were coming, which way to lean as the boat turned sharply, and of course, when the boat was being chased BY A SHARK!! Ahh! On the other side of the forest, we had some ninjas hiding out in their ninja base on the roof of our den. The ninjas silently scaled the slippery sides of the den, pulling each other up if help was required, before they perched in their base looking out for baddies through binoculars. Some of the children were fascinated by penguins this week (perhaps you’ve been watching Blue Planet 2 at home?) and we had many discussions about how penguins keep warm, what noises they make, what they eat and of course how they waddle. We think that the children at Little Forest Folk are some of the kindest and loveliest in the world, and we are so lucky to share our days with these gorgeous little people, watching them grow and develop whilst having buckets of fun. This week, the educators have been particularly humbled and so very happy to witness what may be the beginnings of life-long friendships budding in the forest. Older PostFulham - Splish, Splash, Splosh!